I'm Amber Kirchner, an Arizona based wedding photographer for couples who want authentic, fun wedding photography. I believe in marrying your best friend, laughing until you cry, and capturing the genuine moments of your wedding day. I am there to be a partner in the planning process, get pumped about the personal touches of your day, and help you feel relaxed and natural in front of the camera. I KNOW HOW HARD IT IS TO FIND A WEDDING PHOTOGRAPHER WHO YOU TRUST WILL TRULY CAPTURE YOUR WEDDING WHEN YOU DON'T LOOK LIKE THE STANDARD BRIDE. I know how hard it is because I was a tattooed bride planning a Harry Potter inspired wedding while David Tutera was literally covering bride’s tattoos on national TV. I quickly realized my biggest struggle in finding a wedding photographer I trusted was that I did not see myself (nor my husband) in any of the photographs on their websites. That is when my inner rebel decided I would ‘infiltrate the system’ and be a catalyst for change in the wedding industry. I would be a wedding photographer that accepted everyone for who they are... No. More than that: celebrated them for who they are! Shortly after my wedding I set out to create a wedding photography business that broke the mold of the traditional wedding photographer. A business that took pride in two things: diversity and equality. Because we should not have to use terms like ‘LGBTQ’, ‘plus size’, or ‘alternative’ in front of wedding to find diversity. Because, the wedding day is not about the bride. It is about the couple entering their marriage as equals. unique personalities and cultures with their weddings. You and your partner deserve equal attention on your wedding day because you are entering your marriage as equals. I am always looking at the bright side of situations and bring that positivity to every wedding that I photograph. We should not have to use terms like ‘LGBTQ’, ‘plus size’, or ‘alternative’ in front of weddings to find diversity. Love is love and that is all that matters. We met when we were teenagers and I have officially known Josh for more than half of my life! We are truly best friends and love exploring the mountains together, mandatory lazy days, and laughing until we cry. We toasted with butter beer, had custom wands for our bridal party, and ate Bertie Botts Every Flavor Beans. Our honeymoon was spend drinking Butterbeer at the Wizarding World. I am always down for a hike whether that is for backpacking trip or an engagement session. When I am not in the mountains, I can often be found barefoot in my backyard. These two keep our daily lives interesting, that's for sure! 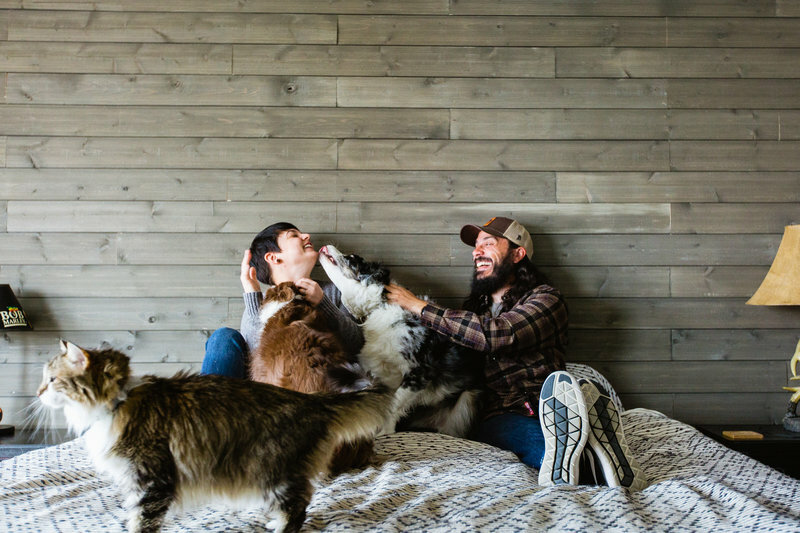 When I am not photographing amazing couples, I an usually cuddling with our two herding dogs (Stormy and Fawkes) or sharing my ice cream with our cat (Bella). We take an annual trip to Disneyland every year. Usually around December (as you can see by my Christmas sweater). And, yes, I have officially met Mary Poppins and Bert. Eat your heart out.